Can somebody here please tell me the difference between a pumpkin and a squash? I'd like to know. Remember our gardening project? The wait is finally over! No worries about frost. 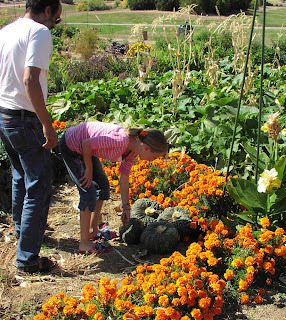 It's been so warm in Colorado, we lost fear of imminent frost destroying our crop. 110 days to mature? No problem! 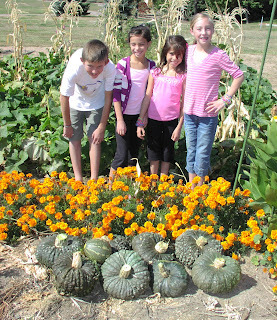 We went and harvested 8 giant ugly squashes on our community patch. How can something as ugly as a Zucca Barruca taste so yummy? It looks like the skin of a witch covered in warts really...But oh, the things you can make with this squash. Last week we cut a single squash in half. It weighed 20 pounds and provided food for our two families for several days. We roasted it and ate it on the side with dinner. We baked it in the oven, and from the pulp I made: pumpkin gnocchi, pumpkin soup, and 3 panfuls of muffins. Delicious. I will share my recipes soon! For now just enjoy the pictures of the harvest! No frost here either! Congrats on your community garden. It looks like a great family project. How cool is that!!!!!!!! YUM!!! Maybe if you made the muffins and didn't tell they were pumpkin they would like them, Andrea? My kids are not great fans of pumpkin flavor as such - but if you find the right recipe it might work?! Pumpkins are a type of squash, like zucchini or acorn. 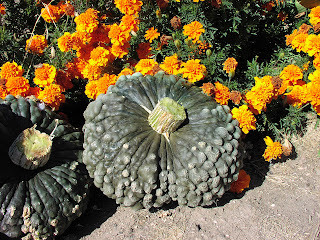 There are many kinds of pumpkins but they are all a winter squash. Does that help? We are big lovers of all squash at my house!